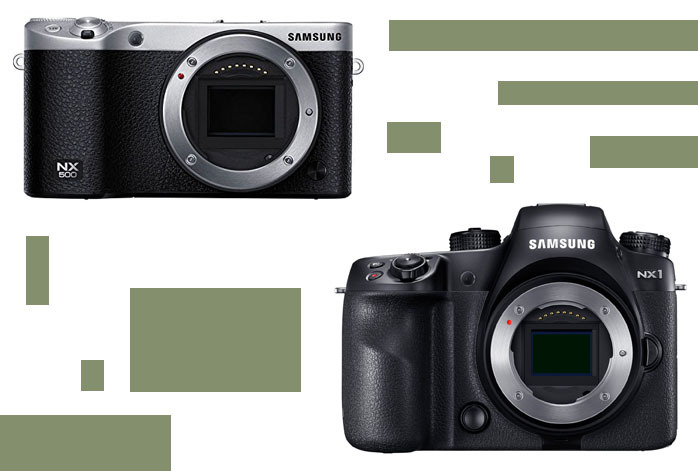 In a prior article, we have compared Samsung NX500 to Samsung NX3000. The two are quite popular choices if you are seeking for powerful images under a thousand bucks. This time, we are about to discuss Samsung NX500 and Samsung NX1. Unlike the previous product comparison, the contenders here are separated by a large price gap. Samsung NX500 is now widely available under a thousand bucks, while Samsung NX1 is still quite pricey with a price tag above one thousand dollars. Thus, some people want to know whether they can get any advantage by going with Samsung NX500 instead of Samsung NX1. Are you having the same question? Find the answer below! Comparing the two products side by side, we can immediately tell that Samsung NX500 has a more compact and portable design than Samsung NX1. The cheaper model is smaller and thinner and lighter. The weight difference is very noticeable. You will be more comfortable with Samsung NX500 in your pocket compared to Samsung NX1. Both models are armed with a 28 MP APS-C CMOS image sensor, which is immensely powerful for producing superb images. Both can produce pictures of the same size and also 4K Ultra HD videos. So, roughly, they can have similar output quality. However, Samsung NX1 is given more advanced features that can give you better control over your images, and deliver enhanced images as the effect. Samsung NX1 comes with built-in flash for precise illumination on your object, electronic viewfinder for optimum framing and control, and also faster maximum shutter speed. Thus, Samsung NX1 can deliver brighter and clearer results, especially for fast-paced actions. Besides having a higher maximum shutter speed, Samsung NX1 also has a much faster continuous shooting speed of 15 fps. As a comparison, Samsung NX500 only has 9 fps. So, Samsung NX1 can give you a considerably better edge for snapping the pictures of fast-moving objects. Samsung NX1 is enriched with more features and connectivity than Samsung NX500. It has a microphone input port so that you can capture high-quality audio for your video recording. There is also a headphone port, in case that you need to perform direct monitoring over your recording. For easy and practical file sharing, both models have built-in Wi-Fi, but Samsung NX1 also has the NFC technology that is even more practical and fast. Last but not least, Samsung NX1 also has a much longer battery life than Samsung NX500. Samsung NX500 can have a comparable picture quality to Samsung NX1. However, Samsung NX1 indeed has a lot more power and control to offer. Therefore, for professional needs, you can’t compromise and go with Samsung NX1. Otherwise, especially if you don’t need to use the additional ports, you can save some bucks with Samsung NX500.